Experts estimate that up to 40 percent of people with Alzheimer’s disease suffer from significant depression. Fortunately, there are many effective non-drug and drug therapies available. Treatment of depression in Alzheimer’s disease can improve a person’s sense of well-being, quality of life and individual function. The cognitive impairment experienced by people with Alzheimer’s often makes it difficult for them to articulate their sadness, hopelessness, guilt and other feelings associated with depression. Depression in Alzheimer’s doesn’t always look like depression in people without the disorder. For example, depression in Alzheimer’s is sometimes less severe and may not last as long or recur as often. Also, people with Alzheimer’s and depression may be less likely to talk openly about wanting to kill themselves, and they are less likely to attempt suicide than depressed individuals without dementia. What’s more, depressive symptoms in Alzheimer’s may come and go, in contrast to memory and thinking problems that worsen steadily over time. 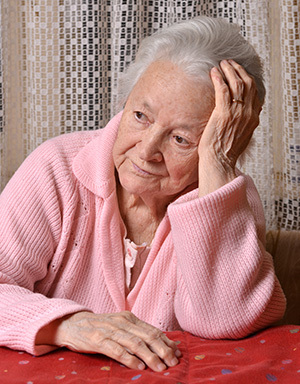 Because of the complexities involved in diagnosing depression in someone with Alzheimer’s, it may be helpful to consult a geriatric psychiatrist who specializes in recognizing and treating depression in older adults. To facilitate diagnosis and treatment of depression in people with Alzheimer’s, the National Institute of Mental Health established a formal set of guidelines for diagnosing the condition. Although the criteria are similar to general diagnostic standards for major depression, they reduce emphasis on verbal expression and include irritability and social isolation. The most common treatment for depression in Alzheimer’s involves a combination of medicine, support and gradual reconnection to activities and people the person finds pleasurable. Simply telling the person with Alzheimer’s to “cheer up,” “snap out of it,” or “try harder” is seldom helpful. Depressed people with or without Alzheimer’s are rarely able to make themselves better by sheer will, or without lots of support, reassurance, and professional help.